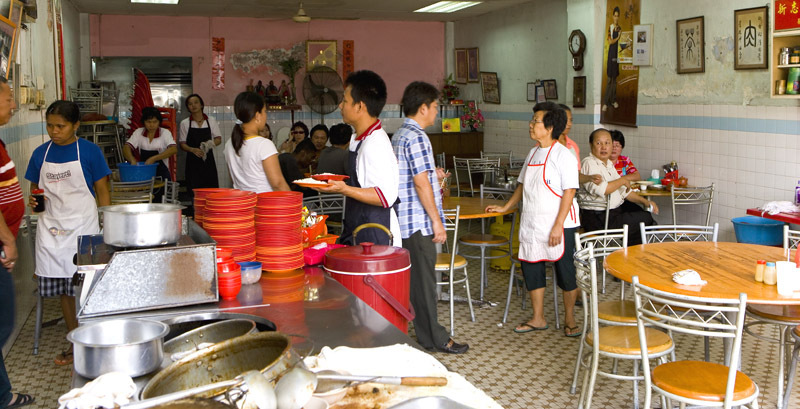 I always assumed this was a Chinese dish, but the best version I've encountered in Thailand was in Hat Yai http://www.austinbushphotography.com/2008/02/deep-south.html), a town that sees many Malaysian tourists. Pork testicles were one optional meat. At the risk of going off on an entirely unrelated tangent, the second picture from the top reminds me of something I've been meaning to ask about: Malaysian rice. In a country with such amazing food, why is the rice, at least in my limited experience, so bad? 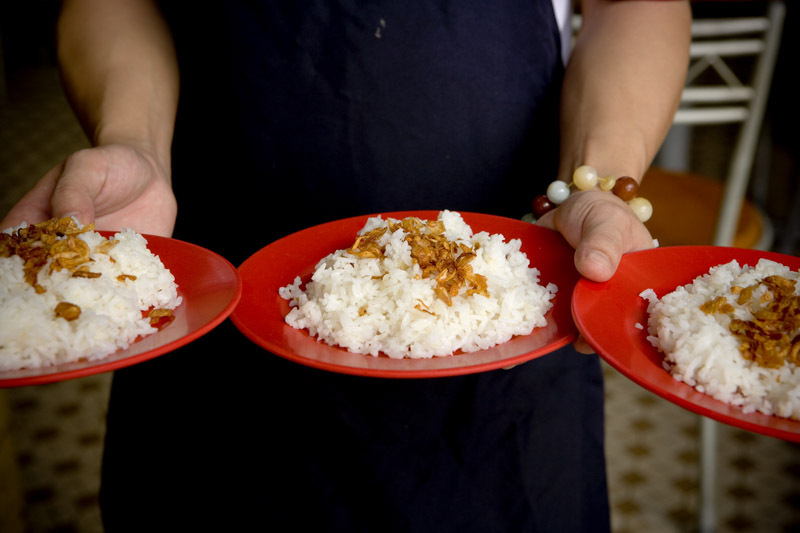 Not only did it often seem to be poor quality rice to begin with, but it was also often overcooked and stodgy. Am I simply unlucky in this or have you noticed this as well? I'm really curious, as this is something I've noticed on each of my numerous trips to Malaysia. How did I not try this? Boooo. "their passion for the other white meat"
Also -- mmmmmmm. Looks like we have to make a side trip this winter break. BM - man, you have no idea! There's a lot of stuff you didn't try, and it's not because we didn't make the effort for you. 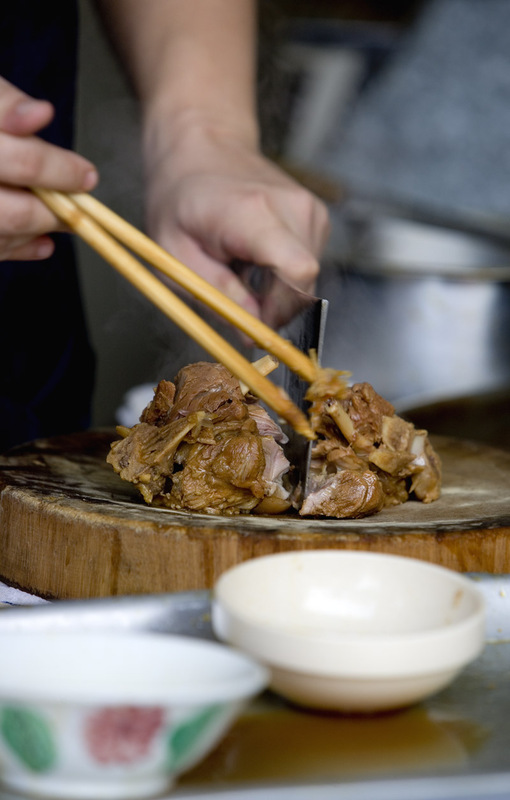 BTW -- we are now taking reservations for an exclusive 3D/2N All Pork And Nothing But Pork guided tour. Austin - Unrelated tangents welcome. I hope a Malaysian pipes up here. I would zero in on the phrase you used: 'in my limited experience'. I mean, isn't your query about rice sort of like someone saying 'why is guayteow nam in Thailand so bad?' As with any food, anywhere, there's not-so-good stuff, and there's good stuff, and you gotta know where to find the latter. 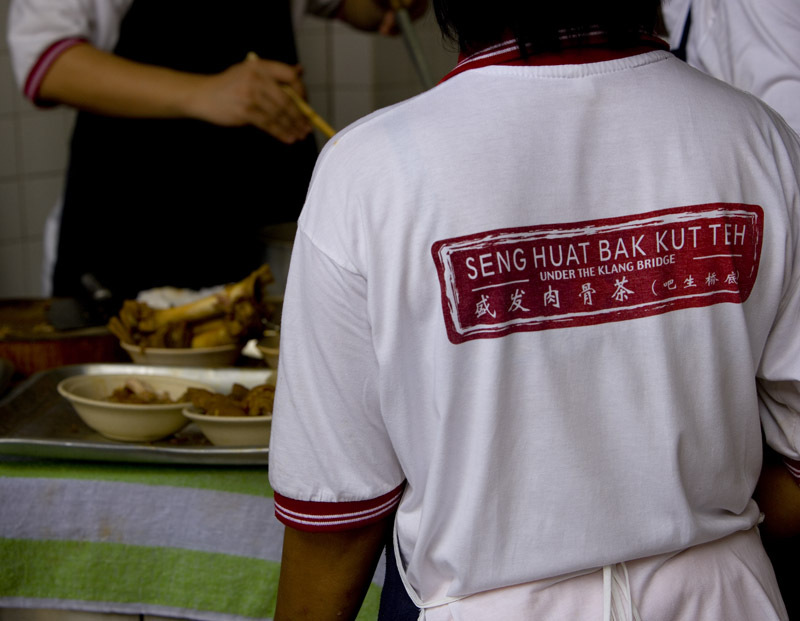 Incidentally, much of the rice eaten here is Thai (this bak kut teh place uses half Thai-half Malaysian rice). 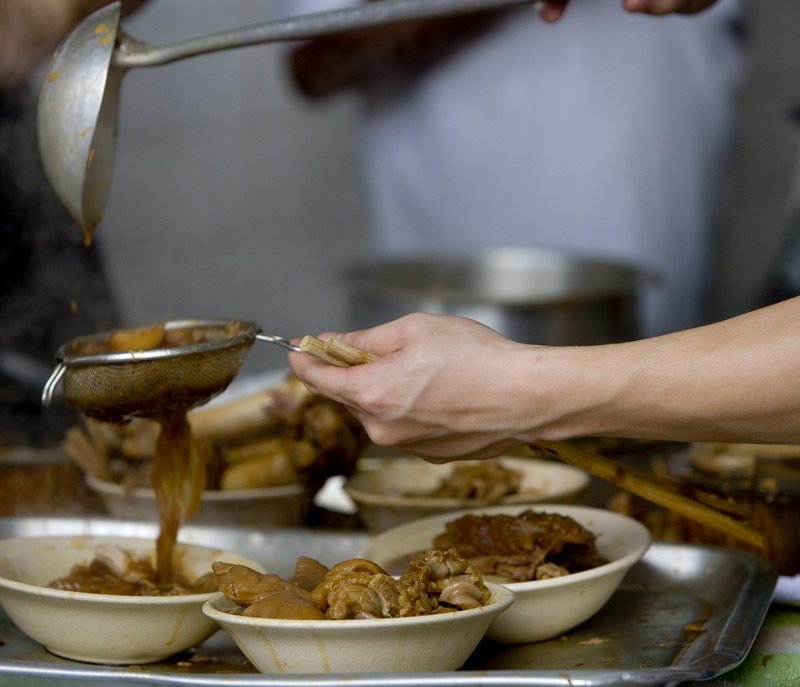 Malaysians can be as fanatical about rice as Thais - anyone here will tell you that the mark of an excellent nasi lemak and Hainanese chicken rice is rice cooked so that the grains are distinct and hold their shape. It's out there, if you know where to find it. Don't know where you've traveled on your many visits to Malaysia but there are some pretty fantastic rice dishes specific to the east coast - nasi kerabu (which you'd recognize as khao yam) and nasi kukus, to name a couple. In fact there's a restaurant here in KL that doesn't boil, but steams it rice in metal bowls in a gigantic steamer. It doesn't get much better than that, IMO. Also as I'm sure you know Malay and Indian foods are often eaten with the right hand rather than with fork and spoon, so a bit of stickiness in the rice is preferred. I won't argue rice produced in Malaysia is great - only that rice dishes prepared here are not as bad as all that, if you eat at the right places. I've been to Malaysia at least...six (?) times in the last decade, and so am not entirely sure how to quantify that. You're right in that they do have some interesting rice-based dishes, but I was actually referring to the plain rice served with other dishes in Chinese and particularly Malaysian restaurants. I found it to be of even lesser quality than places like Burma or Cambodia, although I have no idea what kind of rice people eat at home. Borrowing your phrase, and based on what you said, I guess one could conclude that plain rice is potentially the 'not-so-good stuff' of Malaysia? And although I realize it was simply a throwaway example, I would agree that the kuaytiaow nam in Thailand is, in general, pretty bad. It's only recently that I've really begun to enjoy noodles in Thailand, but the average pork or fish ball noodles on the street are pretty nasty. Austin - 'even lesser quality than places like Burma or Cambodia'. I'm not gonna touch that with a ten-foot pole. Karen Coates has maintained that Cambodia has the best rice in the world. Vietnamese like Vietnamese rice. Philippine rice is pretty darned good. I've had great plain white rice here and crappy (and excellent) white rice in Thailand. In the end, rating rice seems as subjective as rating wine. Also - I think you mean 'Chinese and Malay' not 'Chinese and Malaysian' restaurants? 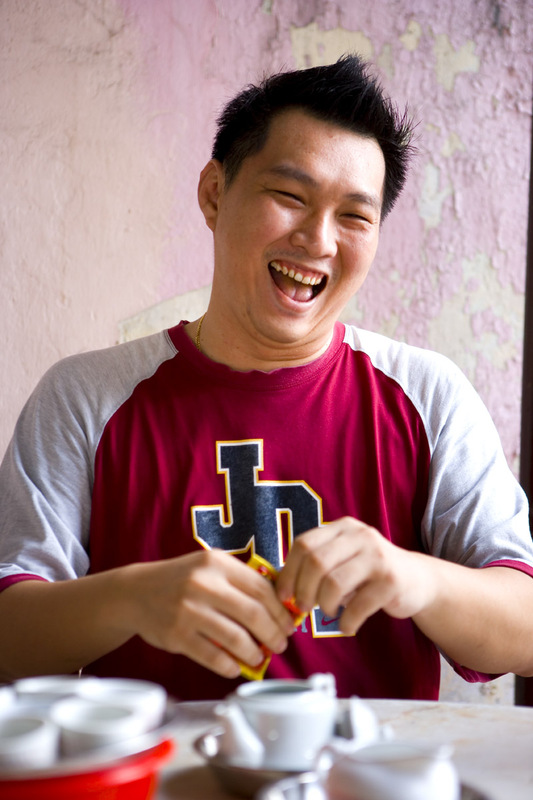 Chinese in Malaysia would consider themselves as Malaysian as Malay (and Indian) Malaysians. A common mistake in nomenclature. 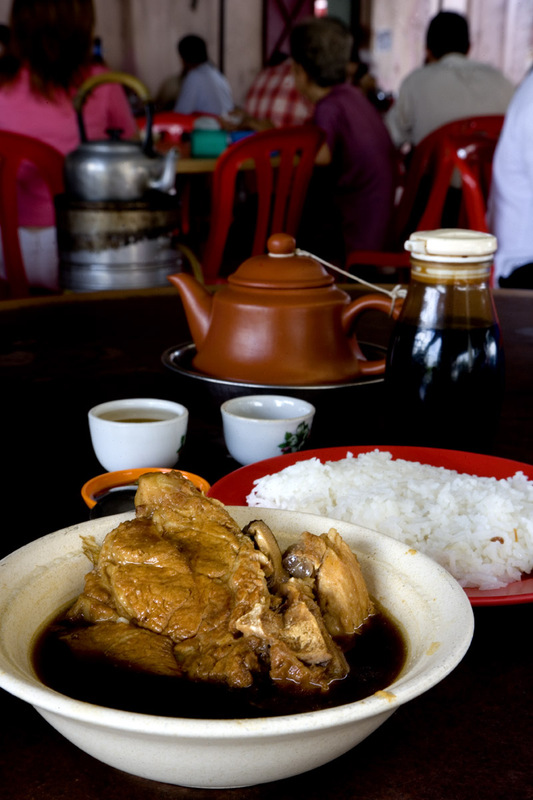 The Bah Kut Teh looks good. I bought a bunch of A1 Bah Kut Teh spice packets at Giant supermarket while I was in KL earlier this year. I cooked it myself using pork ribs. It is good for my standards. I can buy Yaw Cha Kwai (curlers) at the Asian markets. They are made in New York city. i am malaysian and i can attest to the fact that you do get some awful rice back home. that said, when i was in thailand for a month, for the life of me, i could not find pad thai that was worth eating. all that sugar everywhere! so, i guess it's a case of being at the right place at the right time. and also, personal taste has to be factored in. Not sure if Im the best person to say this (am not even Malaysian! )but with regards to the name 'ba-Kut-teh', I think the common Malaysian translation of 'pork-bone-tea' is not mistranslated at all. In Hokkien, 'Ba' or 'Ma'(as how its pronounced here in the Philippines) simply means 'meat' and 'meat' almost exclusively means pork. Kinda like how the Chinese word for child and son is one and the same. When we pertain to beef, we add the word 'Gu' before 'Ba'. MSW - Thanks for your comment but you misunderstant my point. 'Rou' means, literally, 'meat'. That is how it is translated in a dictionary. I do understand that for Chinese rou brings to mind pork. That's why I made the distinction --- it tells us how very important pork is in Chs culinary culture. But your comment makes me think I should change 'mistranslate' to 'understand'. Stephanie - please get your friend's interpretation and post it! Seriously, i like malaysian food ofcos. I like to eat rice. As for Robyn said, truely, mostly of the restaurant or stall in malaysia tend to serve "not so good" quality white rice..it;s a fact. ohya...wat to do... rice is not cheap now. 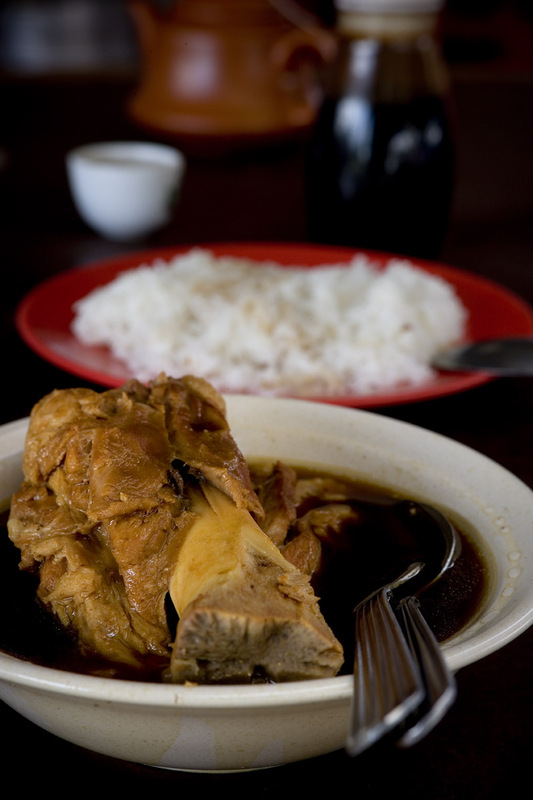 where can i get bak kut teh in manila, philippines? i love that stuff.